The BlackWidow TE Chroma is a compact, ten-keyless version of the Blackwidow Chroma – and available now on Razer’s site. 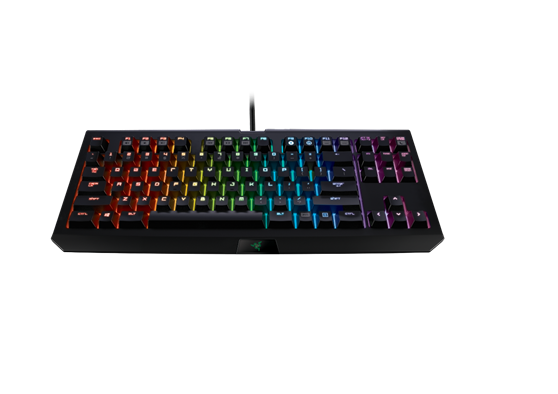 Razer today announced the release of the new Razer BlackWidow TE (Tournament Edition) Chroma gaming keyboard. This update to the Razer BlackWidow TE adds 16.8 million customizable, color backlighting. Otherwise, it’s much the same as the original BlackWidow TE, which is to say it’s a compact BlackWidow Chroma keyboard without the ten key pad and extra macro keys. The mechanical switches have also been updated to use Razer’s custom, ‘gaming optimized’ Razer Green switches. Rounding out the TE’s feature list is a detachable USB cable to make the Razer BlackWidow TE Chroma as travel friendly as possible. Having used the Razer BlackWidow TE it’s pretty easy to guess that the Chroma edition will be an outstanding update, although on a personal note I wish the BlackWidow TE Chroma retained the 5 macro keys found on the full-sized Razer BlackWidow Chroma. I won’t miss a ten key pad, but I like having a few dedicated macro keys. The Razer BlackWidow TE Chroma edition is now available in Razer’s online store for $140.